The microphone was positioned a few inches from my mouth. The technician did a sound check. I looked up to the ceiling where a little, almost inconspicuous, light bulb hung in the corner of the room. The light would glow a warm red indicating when we would be “on air”. I had been on the radio only once in the past, to promote a show I was doing at the time. It was a brief ten-minute talk about who, what and where, but this was a one hour show and I wondered if I had enough dialogue to fill it. I smiled at my host, Colleen Brow, sitting opposite me with her own microphone ready to go. It promised to be an evening of easy conversation about my journey through the world of theatre, arthritis and writing. Colleen and I met on stage performing a charming play set in small town post-war Canada, and like all actors bound together for months of rehearsals and weeks of performance, we engaged in dressing room banter about life, loves, journeys and dreams. 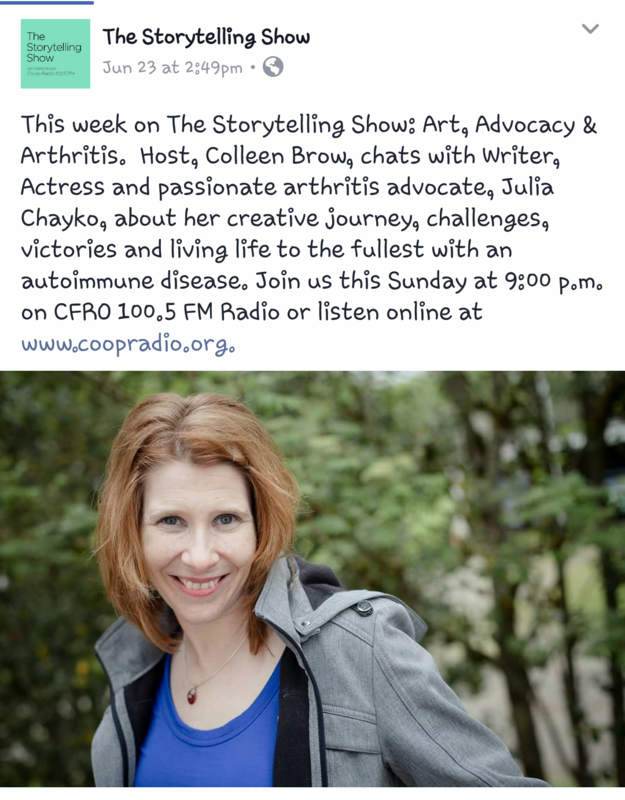 I learned my talented co-star hosted a local radio program called The Storytelling Show on Vancouver Co-op Radio. It was in the dressing room where the idea of art, arthritis and advocacy came to life. Art, arthritis and advocacy are woven into the threads of my life. The art came first, then the arthritis, then the advocacy – the latter quite by accident. I didn’t plan on arthritis being a spotlight in my life, but because it was a part of me, it became tangled in everything I did. I created a life in the arts with RA in the same way I built my previous life – by knowing what I could and could not do, pursuing new opportunities, immersing myself in unfamiliar territory and leaving myself open to discovering all the little things entrenched within. I tugged on the loose thread of chance, unraveling a part of my life so I could stitch it back into my own design. The hour went by so fast. I didn’t have to worry about whether I had enough material to discuss – there was so much to talk about that in the last ten minutes I talked as quickly as possible to say as much as I could. It seemed we could have used an hour for each topic. Summer of 69 – Bryan Adams: this song celebrates the good days, and encourages the celebration and appreciation of each notable moment in our lives. Wide River to Cross – Diana Krall: this is about the journey that is always ahead, a powerful reminder of how far I’ve come and how far I’ve yet to go. Edge of the Ocean – Ivy: this song is about transformation. Life doesn’t stay the same. It flows and shifts, and we are carried along in its tide, entangled in its constant revolutions. Art is found in everything – in the dark, in the light, in music, in silence, in the air, in the water, in the young and the old, in health and in sickness. I never realized how easily one element blended into the other. Arthritis became a part of my art. It dictated the way I moved on stage, it seeped into my prose, and in an unexpected twist, it set me on the path to advocacy. I had a complete trilogy. It wasn’t easy to keep art alive in the face of RA, but it was necessary. Art is the light at the end of my tunnel, chasing away the shadows of those dark painful days that muddy the vision of my unblemished path. 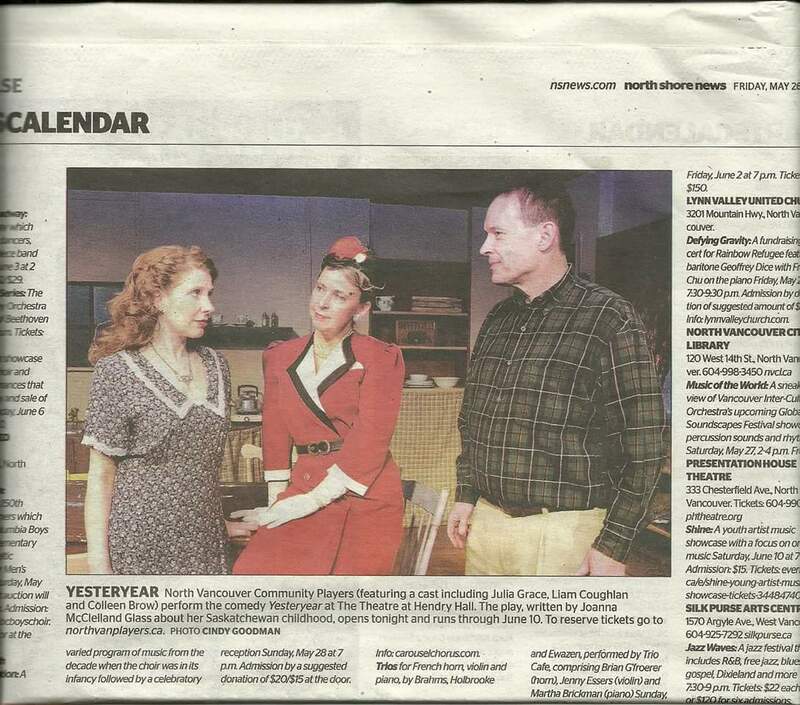 Myself, Colleen Brow and Liam Coughlin in Yesteryear as photographed in the North Shore News. You can hear my conversation in The Storytelling Show archives.